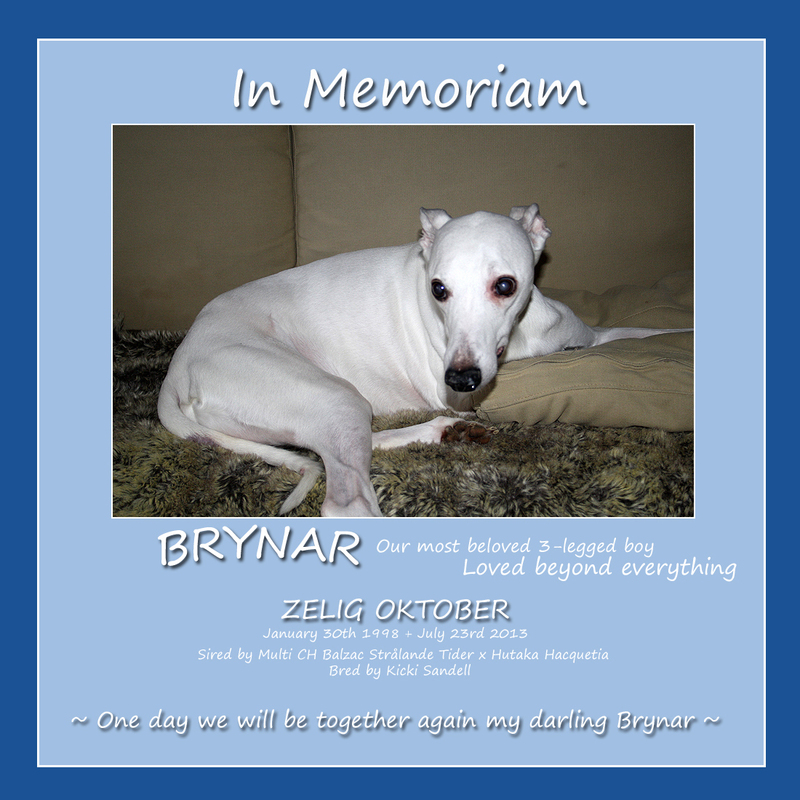 Brynar has only three legs since he had to amputade his right front leg 2004 due to *angiosarcoma in his paw. *Angiosarcomas: arguably the most aggressive of all soft-tissue tumours, are composed of cells that have many functional and morphologic features of normal endothelium. Although these tumnours are often divided into hemangiosarcomas (of purported blood vessel origin) and lymfangiosarcomas (of lymphatic vessel origin), such as distinction is arbitrary. the term angioendothelioma is also used. These tumours generally arise spontaneously , but in dogs with short, often white coats, chronic solar injury has induced a change in the superficial vascular plexus, which initially appears as a hemangiosarcoma and then progresses to a malignant vascular tumour. The breed prone to actinically induced angiosarcomas are whippets, italian greyhounds, white boxers and pitbulls. Pathologists will often diagnosethese lesions as cutaneous hemangiosarcomas.